Now the last developments of the top range Tony Kart chassis are official. The models Racer 401R and Krypton 801R for Ok and KZ, and Rookie EV for the Mini. All the chassis have a new graphic and some improvements on the components. For the Rookies also the frame has been modified and the brake system has been redisgned. Racer 401 R, Krypton 801 R and Rookie EV are the latest versions of the top models of the Tony Kart chassis range, suitable not only for experienced drivers but also for youngest drivers in Mini class. The Racer is the chassis “Symbol” of the company: born in 2000, it boasts 7 World Titles and many other international titles in all the classes. All the improvements brought to 2019 chassis have been thought, developed and tested by the Tony Kart official racing team during the most important competitions around the world: these are the essential conditions for giving all the drivers high quality and reliable karts. For Racer 401R and Krypton 801R, both available in direct drive and shifter version, the bare frame geometry are unchanged, the most interesting innovations concern the componentry. Geometry, accessories and production method are the same for both models, the main difference is in the diameter of the steel molybdenum Chrome tubes: 30mm for the Racer and 32mm for the Krypton. The Rookie has new bare frame geometry, a new brake system, new stub axle and seat available in two sizes. Thanks to computer CFD simulations, the technicians of the Research and Development Department of the OTK Kart Group developed the new M7 Nassau panel for the Racer and Krypton: its shape is characterized by a unique and revolutionary design, perfectly integrated with M6 bodyworks. Another great change is the integrated floor plate, a special type of floor plate whose configuration completely seals the frame frontal area, considerably improving the aerodynamic output. The Racer 401 R and the Krypton 801 R are provided with the new steering wheel covered with high grip rubber. This new solution grants a better comfort and a better driving feeling for the driver. Moreover also the inclined steering wheel hub is new and provided as standard, this allow to better adjust the driving position. The use of high quality materials and innovative methods of production are the main characteristics of OTK Kart Group, especially for the kart for KZ class: the most complete of the range. Besides all the technical characteristics of the OK, on the KZ there is also an optimized bare frame design and the Bss brake system, equipped with self adjusting front brakes system with one-piece front calipers with 4 pistons 22 mm Ø . 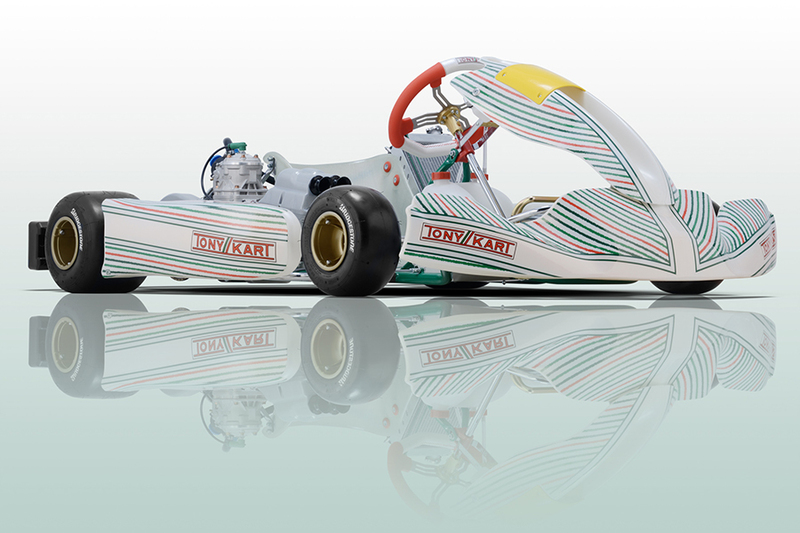 The chassis for the Mini class is completely new, with characteristics similar to the top models of Tony Kart Range. The bare has new geometry, keeping unchanged the wheel base of 950mm and the tubes diameter of 28mm. The Rookie EV is also characterized by a new design profile, with 2019 graphics similar to the Racer 401R. The OTK Kart Group R&D Department carried out a great job on the brake system, called BSM4, it has been completely re-designed. Its main features are: Ergal caliper equipped with 4 pistons, self ventilated brake disc and one-piece brake pump in Ergal.